Long before the Red Sox "Impossible Dream" season, Boston’s now nearly forgotten “other” team, the 1914 Boston Braves, performed a baseball “miracle” that resounds to this very day. The "Miracle Braves" were Boston's first "worst-to-first" winners of the World Series. Shortly after the turn of the previous century, the once mighty Braves had become a perennial member of the National League’s second division. Preseason pundits didn't believe the 1914 team posed a meaningful threat to John McGraw’s powerful New York Giants. During the first half of that campaign, Boston lived down to such expectations, taking up residence in the league’s basement. Refusing to throw in the towel at the midseason mark, their leader, the pugnacious George Stallings, deftly manipulated his daily lineup and pitching staff to engineer a remarkable second-half climb in the standings all the way to first place. The team’s winning momentum carried into the postseason, where the Braves swept Connie Mack's heralded Athletics and claimed the only World Championship ever won by Boston’s National League entry. And for 100 years, the management, players, and fans of under-performing ball clubs have turned to the Miracle Braves to catch a glimmer of hope that such a midseason turnaround could be repeated. Through the collaborative efforts of a band of dedicated members of the Society for American Baseball Research, this benchmark accomplishment is richly revealed to the reader in The Miracle Braves of 1914: Boston's Original Worst-to-First World Series Champions. The essence of the “miracle” is captured through a comprehensive compendium of incisive biographies of the players and other figures associated with the team, with additional relevant research pieces on the season. After a journey through the pages of this book, the die-hard baseball fan will better understand why the call to “Wait Until Next Year” should never be voiced prematurely. E-book: Click here to download the e-book version of The Miracle Braves of 1914 for FREE from the SABR Store. Available in PDF, Kindle/MOBI and EPUB formats. Paperback: Get a 50% discount on the paperback edition of The Miracle Braves of 1914 from the SABR Store ($15.99 includes shipping/tax). E-book: Click here to purchase the e-book version of The Miracle Braves of 1914 for $9.99 from the SABR Store. Available in PDF, Kindle/MOBI and EPUB formats. 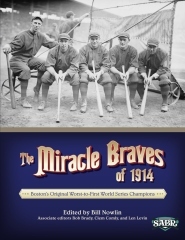 Paperback: Get the paperback edition of The Miracle Braves of 1914 from the SABR Store ($30.99 includes shipping/tax). Read 1914 Braves bios online: Biographies from this book can now be read online by clicking here. This page was last updated October 31, 2017 at 8:22 pm MST.